I attempted to lose with with weight loss supplements and different low carb programs in the past. However, the pounds soon returned after slowly moving myself off those diets. The various low carb programs and other diets were not helping me create a new lifestyle that I could sustain for life. Those methods are successful for some individuals, just not for me. I learned on my weight loss journey to find a plan/method that I could commit to for life. However, I’m still mindful of the healthy carbohydrates that I eat. After my physician stated to me I needed to lose weight at a doctor’s appointment, and subsequently being diagnosed with prediabetes and bad cholesterol levels, I unquestionably wanted to live to see my children reach a mature age. I decided I wanted to take control of health so that I could get back to feeling comfortable in my own skin. 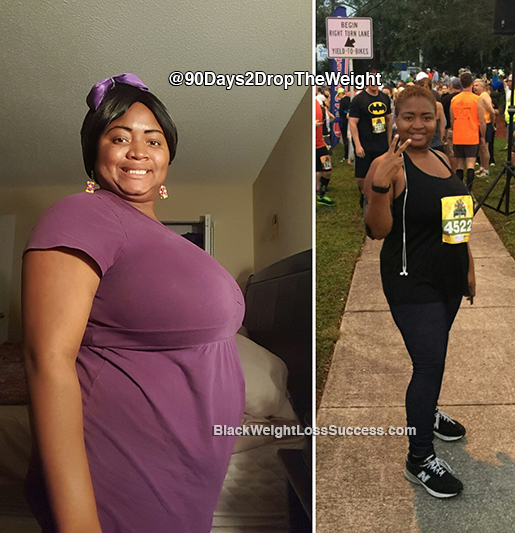 I immediately formed my Facebook group called “90day(s)2dropTheWeight”. August 16, 2015 was the day I started my 90 day weight loss challenge in the group, all while training my mind to eat clean and healthy. After all, I didn’t have anything to lose. I also joined the Black Girls Run group for a support system, since none of my family members were committed. The ladies in the BGR running group provided tons of positive energy and support. I’ve met friends in the group that I will cherish for a lifetime and I gained a new hobby: running! My life changed when I joined the BGR group. I’ve already completed my 1st 5k race on Thanksgiving and my 1st 10k race since beginning my 90day2DropTheWeight journey/challenge back in August 2015. I’m down 50lbs and I have 60 more pounds to drop. I started counting calories and downloaded the My Fitness Pal app to keep count of the calories I eat. Life is less stressful since I only have to insert my food into the Fitness Pal App and the app does all the carb counting for me. I’ve learned that counting calories is a lifestyle change that I can be obligated to for my entire life. Fast food was my biggest obstacle. I consumed fast food 4-5 days per week. My 90 day challenge consisted of fresh fruits, vegetable and chicken and turkey only for meat. I’ve never been a fan of soda, but loved sweet tea. Now, I only drink water or zero calorie liquids. However, I still have two cheat days during each month when I eat whatever I want in order to keep maintaining the lifestyle change. I downloaded the Couchto5k app, trained, and ran my first 5k race. I walked and jogged five days per week. Furthermore, I strength trained 2-3 days per week. Choose a weight loss approach that you can commit to for life. Join a group for support. Challenge yourself for 60-90 days to slowly lose weight by joining a group or challenge. Research weight loss advice or read books for nutrition advice. Never give up. My weight loss story is on Youtube: 90Days 2DropTheWeight. 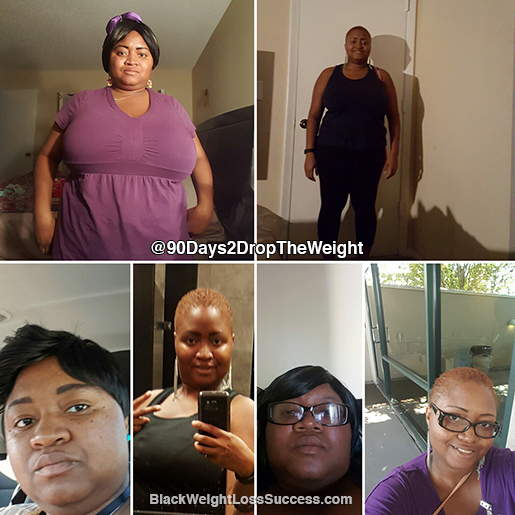 Also, I can be found on Facebook in my group or on Instagram : @90Days2DropTheWeight.